We've been granted a road closure on the Mountain Section! We’re absolutely delighted that for the first time we will now have closed roads for the sportive on the Mountain Section! Thank you to the Department of Highways and the Isle of Man Government for granting us this road closure – as cyclists you will now enjoy a completely traffic-free ride between Ramsey and the Creg-ny-Baa – a first in this sportive’s history! New for 2019! This year we will hosting our halfway refreshment stop at the Sulby Glen Hotel, one of the TT course’s iconic landmarks. A 67-year-old man has completed the Isle of Man Cycling Challenge having pedalled all the way to the start line from Switzerland. Armin Ziegler took seven days to cycle his human-powered vehicle the 615mi (991km) from the Swiss-France border. Competitors had the option of cycling one, two or three laps of the world famous Mountain course on Saturday. It was the first year velomobiles were allowed to take part in the event. A velomobile is a human-powered vehicle, typically a recumbent tricycle in which the rider is enclosed in an aerodynamic shell. The retired engineer from Zurich rode a single lap of the 37-mile (60km) course in three hours and was the only finisher in the veteran class. Organiser Laura Mearns said: "Mr Ziegler made a very special effort to compete after an epic journey. It is a fantastic achievement and we are delighted to see him competing in a field that also included veterans and former TT racers." She said a record 130 people took part in the challenge now in its sixth year. 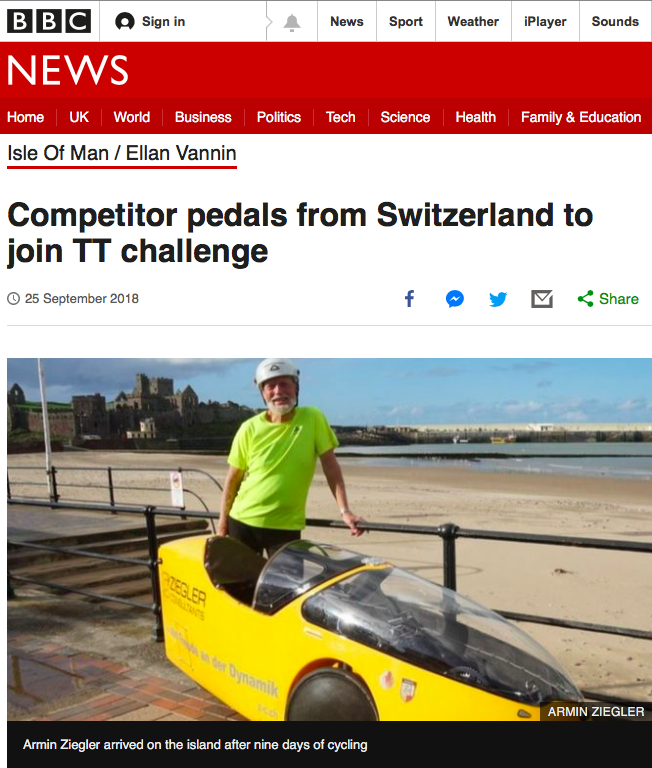 Mr Ziegler, who first visited the Isle of Man to watch the TT races 44 years ago, now plans to complete the return journey in his carbon fibre machine. "I managed to book a hotel at the other end of the island so I had to do a few extra miles to get to the start but it is a great event." "I also got caught in the storms on my way to the island but I eventually got on a ferry." Ian Perry, of the British Human Powered Vehicle Club, was the quickest to complete three laps in six hours, 18 minutes and 21 seconds. Ever since we first saw a velomobile we have thought they would make an amazing sight on the TT course. And now, for 2018, we have our first velomobile entries – so far from Ian Perry and Neil Fleming. We're delighted to welcome them and can't wait to see them both in action. And in the meantime we have a new favourite word – 'velonaut'! I had never heard of the IOMCC until Joe Mearns a co-organiser of the ride approached The British Human Powered Club to ask if any velomobile riders would be interested in taking part. I have over the years undertaken quite a few hard rides, some over many days so this one piqued my interest when I saw that it’s on nothing less than the IOMTT course! A quick check highlighted a ride profile that is very challenging, with long and sometimes steep ascents and very fast descents, and an option to do the circuit 3 times, this coupled with the chance to actually experience the history of this iconic circuit, the grandstand, the memorials to TT riders, famous pubs and be pampered as well made it a must do event. I do have reservations about riding though, my velomobile despite being light for its type due to its carbon fibre monocoque construction at 25kg was designed for going fast on flat lands, the design having originating in the Netherlands, so an added challenge for me will be the hills, I will be very slow up, and very fast down! If bravery and weather allows, or brakes fade, speeds of 80mph plus could be achieved. Andy Jackson wins the 12hr challenge! Andy Jackson of Evo2Max wins the Isle of Man CC 2017 12-hour challenge! We're keeping a very close eye on the weather forecast up to Saturday because at the moment it looks like there may be an issue with both wind and hill fog on the mountain. At last we have our very own IOMCC cycling kit! We can now offer both cycle jerseys and bib shorts made out of very lovely bamboo blended fabric and in both mens and ladies cuts and sizes. The inspirational story of Mark Howard, the first man to attempt to hand cycle the TT course.